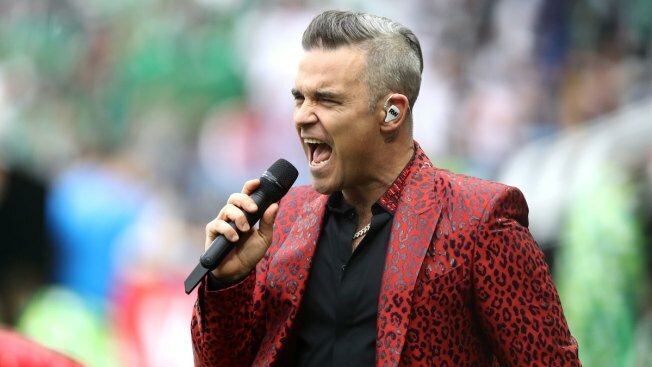 British pop star Robbie Williams performs during the opening ceremony prior to the 2018 FIFA World Cup Russia Group A match between Russia and Saudi Arabia at Luzhniki Stadium in Moscow on Thursday, June 14, 2018. Maybe he was just trying to say World Cup is number 1? Performing in front of a raucous Russian crowd Thursday morning, English pop singer Robbie Williams got the World Cup coverage off to a dubious start by flipping the bird on live TV. Williams has received a record 18 Brit Awards, winning Best British Male four times. His decision to perform at the event was criticized by many leading up to the World Cup because of Russia's record on human rights and its role in the Syrian War. Russia is on the defensive on many fronts as the tournament begins. The national team is on a losing streak so bad that few expect it to even make it past the first round, and pressure was massive for a victory in the opening match against Saudi Arabia — the Cup's second-lowest-ranked team at No. 67, just ahead of Russia at 70.